Courses with speakers are a good activity for beekeeping associations. Some time ago I lectured in a small town in eastern Sweden. I meet many nice people and personal stories. For example, the best coffee I’ve been having for a long time – freshly made at the pizzeria in the small town of Valdemarsvik. A few years ago, David had no wind protection in front of the hives. Then he had 15-20% winter losses. After setting up wind protection, winter losses fell to below 10%. But in 2017, some colonies received old feed solutions. These colonies suffered and winter losses were therefore higher. 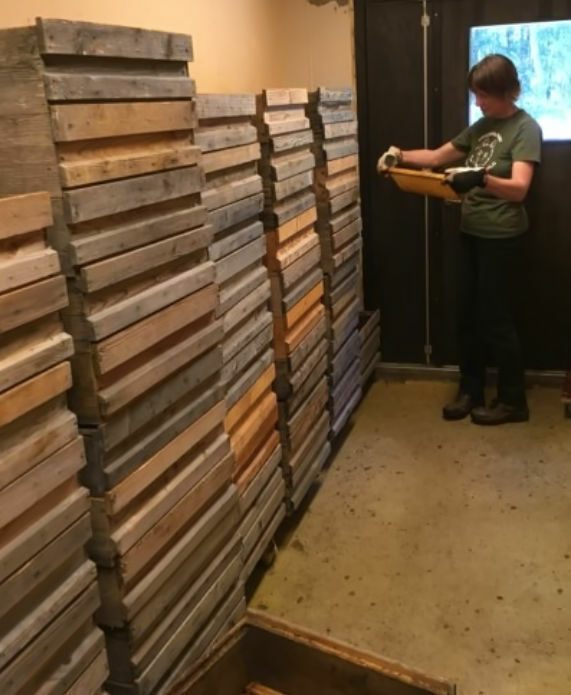 There are more beekeepers than David who have reported higher winter losses and looks when they have given old sugar feed solutions in preparation for winter. Probably, the HMF content had increased during the storage time. Bees withstand high HMF content badly (But it’s not dangerous for humans, there is a lot in, for example, caramel). Four years ago, David bought three Elgon queens from me. Two were accepted by his bees. When he replaced queens in the rest of his colonies to daughters from these two queens he could handle his bees with short pants and without veil. It’s probably good though to wear at least a veil for safety. – But then you used a smoker, I commented. – Yes, David replied. I smoke the entrance and wait a minute. Smoke a little from above and wait a little with the top open. Then we work fine together, the bees and I. Today there are daughters of these first two Elgon queen in seven of my colonies. They are mated in his apiary. One of the original queens is in the eighth colony, now four years old (and five years in 2019 if she survives, her colony is strong). This year he bought three new Elgon. 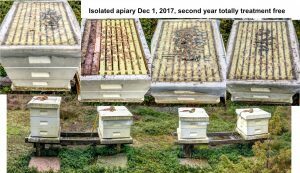 In total, he is wintering 11 colonies in his apiary this year. David uses the standard frame size in Sweden, 366 x 220 mm (14.41” x 8.74”). He uses the standard wax in Sweden with 5.1 mm cell size (five cells to the inch). It’s the cell size of the first foundation from A. I. Roots from America milling rollers in 1876. I wonder if it’s the standard cell size in any other country. It’s about 1 km (0.6 mile) to three apiaries to another beekeeper. There are about 15 Buckfast colonies in each of these beeyards. Within 20 km (12.5 miles) of his Elgon apiary, this beekeeper has a total of about 900 bee colonies. In 2017, David treated his colonies with fumed oxalic acid in early December when there were some degrees above freezing. 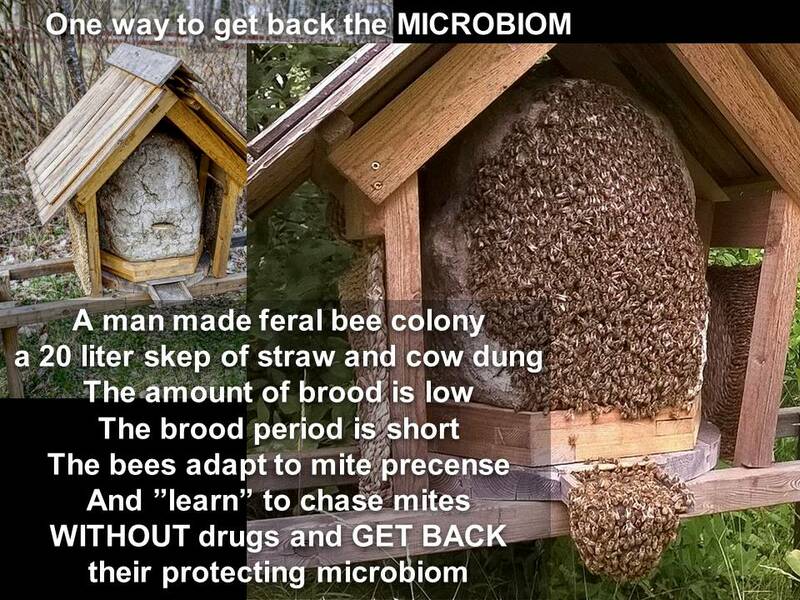 From most colonies, it fell less than 15 mites because of the treatment. From those which it fell more than 15 mites he later treated once again. From the worst it fell 30-40 mites the first time. I pointed out to him that there were very small number of mites. The colonies had certainly not needed any treatment at all. I suggested that he should do a bee shaker (alcohol wash) test test this year (see, for example: http://www.elgon.es/diary/?p=67195 ) before deciding if the colonies needed any treatment. It was in mid October I talked to him about it. At that time of the year elgon bees have no brood, so I pointed out that a bee shaker test is not directly comparable to such a test during the brood season. 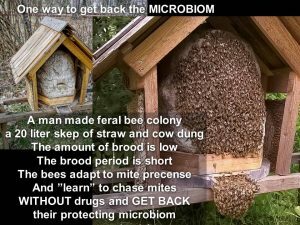 During the season 2/3 of the mites are in the capped brood and not on the bees. This means that monitoring the varroa level with a bee shaker test (alcohol wash) when there’s no brood gives a three times higher value than during the summer season with normal amount of brood. Thus a the figures from a broodless period should be divided by three to get a value comparable with test results during the season with brood. (Click on the table to get it bigger. then click on the back arrow in the browser to get back to the article.) David made a table of his varroa monitoring this fall. One can see that some elgon daughters have a bit more mites than others. And some colonies have very few mites. For finding out the breeding value of these colonies it would have been good to wait with any eventual treatment until spring. But then we had not had these figures. You can at least see from them that there are interesting colonies to investigate more. Yes, really all the colonies are interesting. 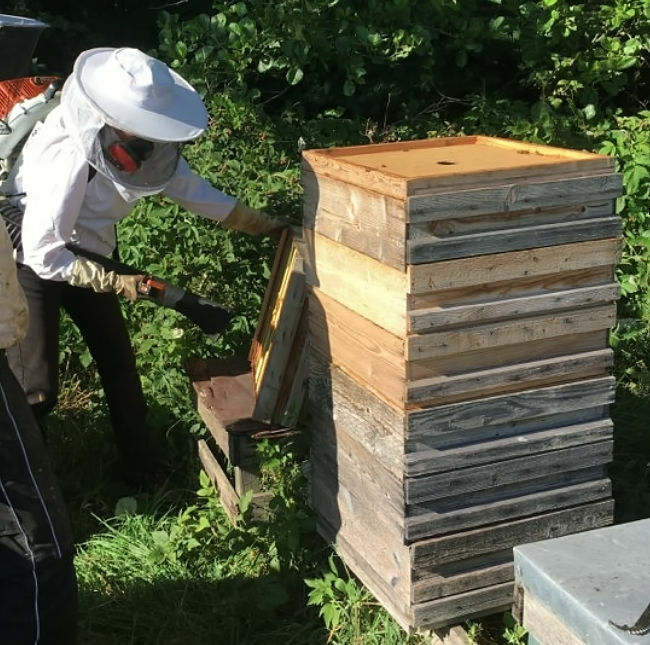 It can also be noted that the beekeeper with 900 colonies most probably managed the treatment of varroa mites effectively, otherwise one could have expected that the varroa levels could have been higher due to reinvasion. One might also conclude that it’s not a disaster if an elgon queen mates with some other drones than elgon ones. This is because a queen mates with as many as about 20 drones on average. And It’s probable that at least some elgon daughters have mated with more than just a few buckfast drones. 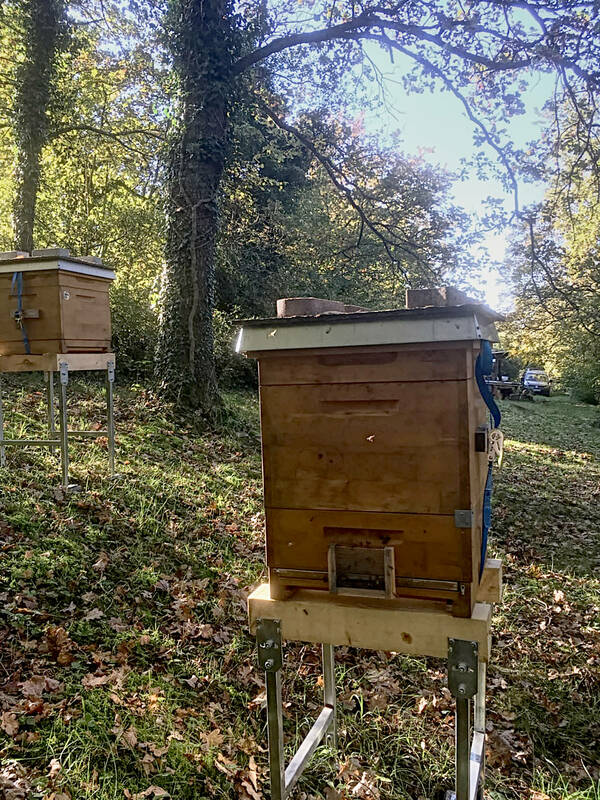 Three colonies, no 4, 5 and 6 were not placed at David’s home during 2017 but in the local association’s apiary used for courses to teach beginners. In this apiary the colonies now have only daughter queens of David’s original elgon queens. David’s three colonies were brought back home in 2018. The three colonies were strong and splits were taken from them. The new queen in no. 5 is a daughter of no. 4 (a swarmcell from that hive). David made bee shaker tests from about half of his colonies in the third week of October. The colony that had the highest number showed 7 mites. Those who had at least were two of the new queens from this year, 3 and 4 mites. 7 mites correspond to a varroa level during the brood season of less than 1%. The colonies were treated a year ago. In mid-November now this year David treated all 11 colonies with fumed oxalic acid. The downfall of mites after treatment varied between 2 and 150. Concerning the colonies from which bee shaker samples were taken, those dropped between 7 and 92 mites. (Click on the chart to get it bigger. then click on the back arrow in the browser to get back to the article.) One can see a connection between the monitored varroa level and dead mites dropped after the treatment. However, there is no linear relationship, which may have more than one explanation. 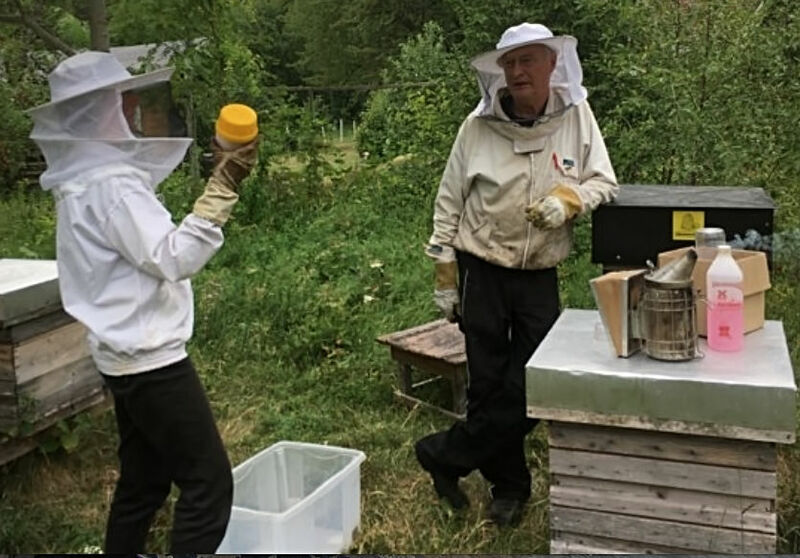 But, the figures of varroa level from the measurements are enough good to provide a sufficiently reliable basis for making a decision if a treatment is desirable as soon as possible or if the hives can wait for a new decision after another monitoring with the bee shaker in spring. 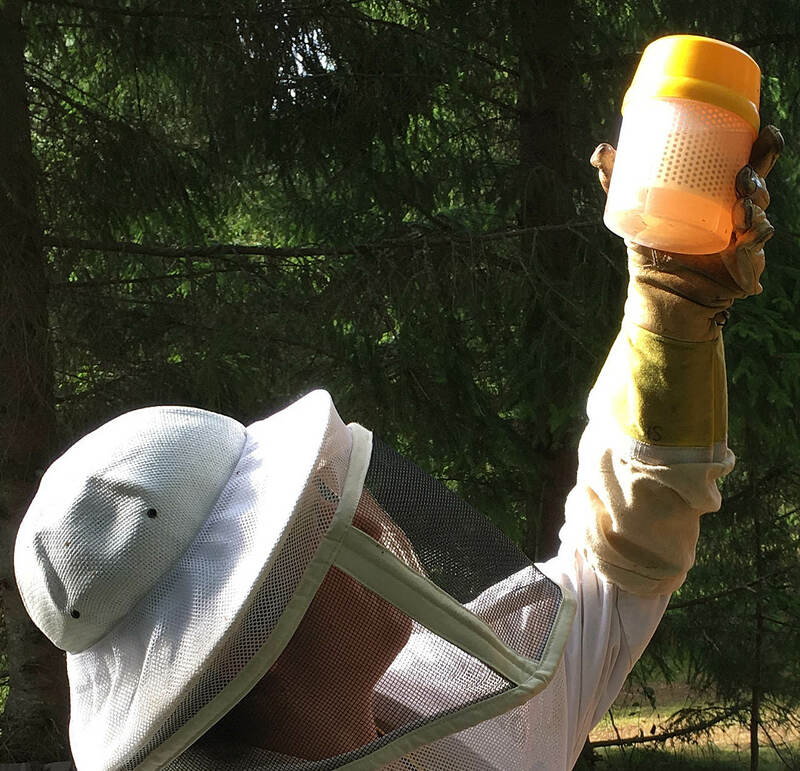 Concerning David’s bees, if it had been up to me to make a decision, I would have waited until spring, first making another varroa monitoring bee shaker test before once again deciding if to treat or not. 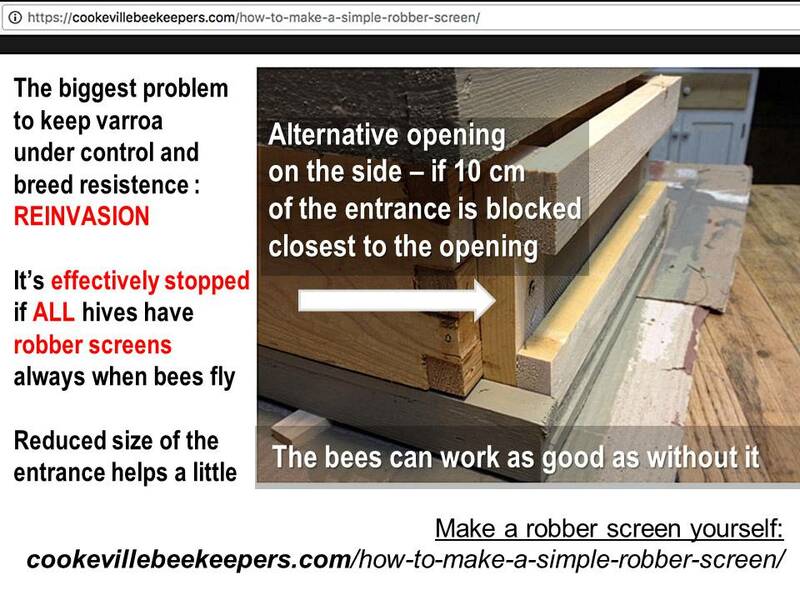 If the varroa level then would be higher than 3 % or not (more than or fewer than 9 mites on 1 dl of bees (300 bees). But then we would not have obtained these comparative figures, which have given us more knowledge. I remember a meeting with the Nordic Baltic Council (with representatives from the bee associations from the different countries) many years ago. Then it was said from Sweden that the goal of the treatment was that all colonies should be going into winter with less than a few hundred mites. In Finland the limit was set to 100 mites. – No colony hadn’t really needed any treatment to survive the winter. – The bee shaker samples gave sufficient information for such a decision. The next varroa level test were then to be done in early May. 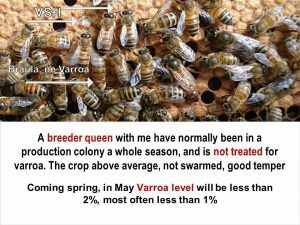 But if David had not done both the varroa level test in October and the oxalic acid treatment in November, we would not have had these informative figures. 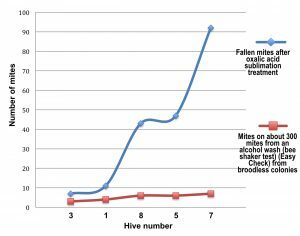 The figures give a graph that point out that there is no linear relationship between the varroa level test and the mite dropping after the treatment. It may be due to different reasons. That would be interesting to find the answer to. It is though enough to say that the figures from the varroa level tests are sufficient to provide you with a sufficiently good information to be able to make the right decision to treat or not to treat. 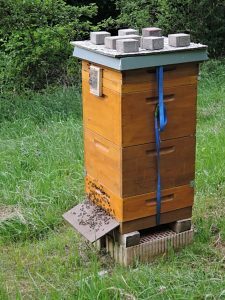 And the most important thing in all breeding work for all beekeepers is always to identify the least good colonies and replace the queens in these. They can get queens or mature queen cells, from some of the other colonies is a good choice. 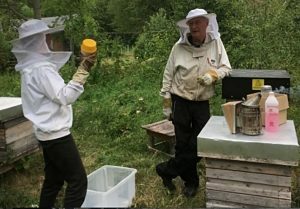 Erik Österlund made us welcome at his home and in his bee yards when we visited with him in July 2018. 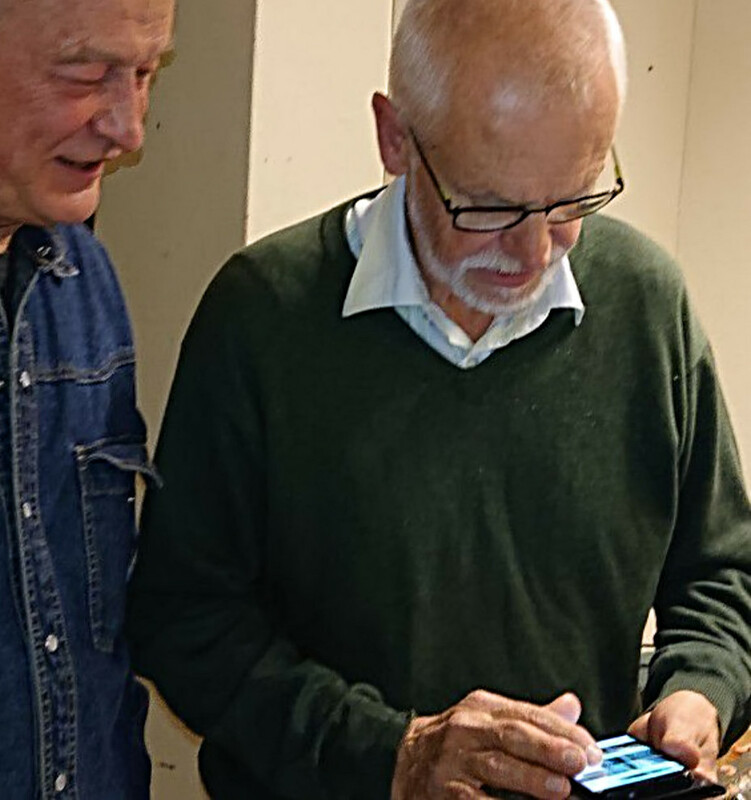 I had asked him for an insight into his resistant breeding project to get some education and learning. As we found out he and his wife Gunvi do not only love to share food! Between coffee breaks we had two weeks of constant work with bee colonies, breeding queens, harvesting, cleaning frames, sorting out combs and whatever work the season wanted us to do. Exactly what I wanted to see and had hoped for. Working the mini mating nucs with Erik and Radim. Wolfgang on the left. Also a pleasure was that we met Radim, Eriks friend, who shares some work with him. Decapping and extracting the honey combs. Most amazing to me was the work flow and how fast and careful it was done with such a high number of hives and mini-mating-nucs compared to my small enterprise. Sorting out badly drawn combs. This work was shared by my dear husband who took most of the pictures. Erik made him a very good beekeeper too! I learned how to graft in a perfect way and the result was not bad, I believe!My saying is: a good teacher produces a good pupil. I even got a try on the bee blower. Me using the bee blower after Erik had put on a bee escape earlier. 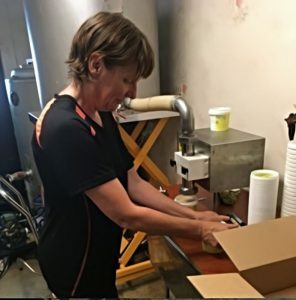 That´s really tough work, lifting all the boxes! Respect! That is work my husband does much better than me. One more action I wanted to see was the mite monitoring by alcohol wash to check the varroa level. I took part in this and got a wonderful lecture about how to evaluate a colonies state beside counting, so to know when to act on the infestation or wait a little and check again. Erik giving me a lecture about mite monitoring. One of the most important actions with respect to resistant breeding in my eyes. We did treatments too, since oxalic and formic acids are a no-go with me. 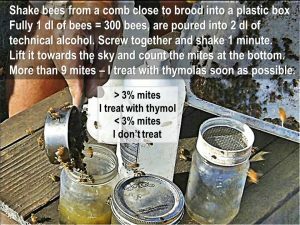 I consider taking out brood or using thymol with the susceptibles if I ever have to do a treatment. My thanks go to Erik and Gunvi! You made us more than happy. I feel much more sure and approved as a beekeeper and you made us feel like a part of your family. We enjoyed the beautiful landscape and even took many swims in the lake where we had rented our little cabin. The lake at which side we had our cabin. This is heartbreaking beautiful. 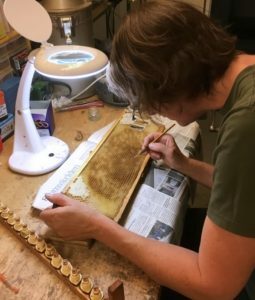 I have focused on the management of my bees and have left other activities aside, such as writing on the blog. We will see if there is any change to this now that the bedding down of bees for winter is finished soon. Many experiences. A lott o think about and analyse. More supering in beginning of May, and more, and more supering. June 1, the extracting began (one month earlier than normal due to the hot weather). In June, extracted boxes were put back on the colonies. More queen breeding and filling of bees in mini mating nucs, etc. In mid-August, the completion of winter feed began with some sugar solution. The amount of remaining honey for winter varies in the colonies, 5 – 25 kg (10-55 lb). 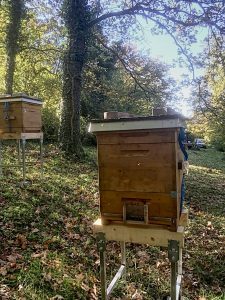 All colonies got at least a some sugar solution so they will end up with about 30 kg (65 lb) of food for winter and the brooding in early spring. Very little of mites this year, will do varroa level tests eventually. 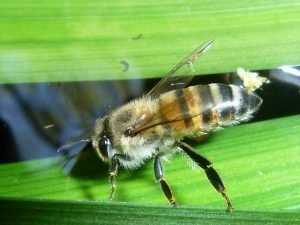 – Italian bees on an isolated island close to the cost of Brazil have showed resistance in the same way as Africanized bees in Brazil. But the varroa level has decreased slower. 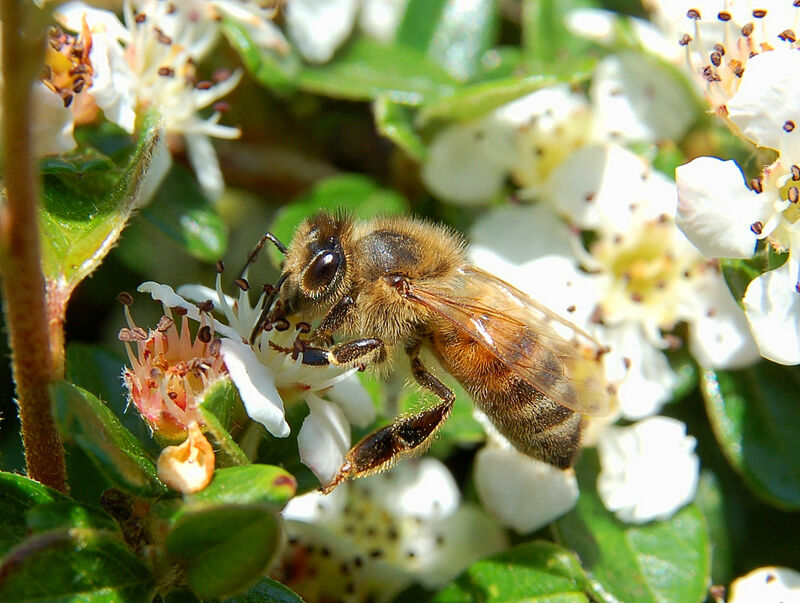 – The original host of the Varroa mite, Apis Cerana, is resistant to the mite and is very similar to Apis mellifera (African and European honeybees). – My Elgon stock is selected for varroa resistance since more than 20 years. • When reinvasion sources are few or none. • When varroa levels are tested regularely. • When bee colonies are treated when the varroa level is above 3%. • Then Elgon bees in my area seems to become resistant. Remy Vandame describes in this doctorate thesis in 1996 that he found the varroa level on worker bees to be 5%. And more than 3000 mites in total. That figure is about the same as in another study in which Vandame also was involved in Mexico some years later. 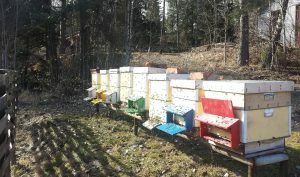 The AHB colonies were not alone in the test apiary. 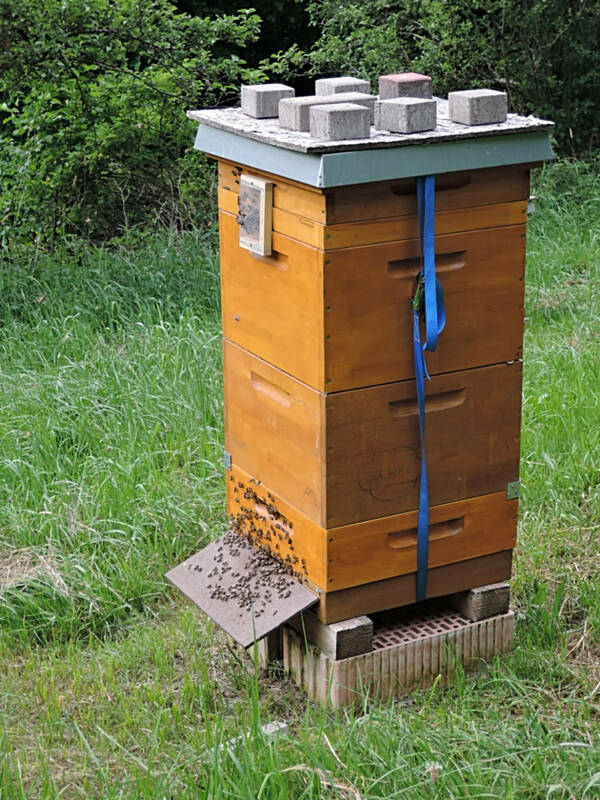 European queens (EHB) crossed with AHB drones in a number of colonies were in the same area. Those had better performance concerning varroa infestation and virus problems compared to EHB in USA or Europe, but not as good as the AHB. Drifting and silent robbery during nectar droughts are strongly suspected to have happened, thus evening out the results somewhat. In 1984 africanized colonies without queens were brought to the island. They were made into 20 colonies in which queens reared from 5 selected Italian colonies from California were inseminated with drones from a colony from Georgia, USA. The number of managed colonies was at the most about 50, today maybe 30. Besides numerous feral colonies that together with the managed colonies form the bee population on Fernando de Norhona. In November 1991 11 colonies were examined for varroa varroa level. In three of these about every second bee had a mite (50%). Average was 26%. Lowest about 9%. In April 1993 more colonies were examined. Highest varroa level 39%, average 19%, lowest about 9%. 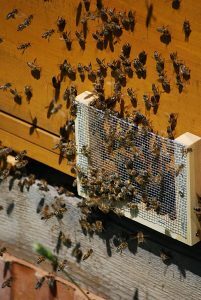 In May 2016 the varroa level was 1-2%. Mites in brood also lower compared to November 2012. (DOI: 10.1038/srep45953) Has the time of the year significance concerning the Varroa level on the island, as it has in other areas of the world. It is lowest in “autumn” whenever that is. Here it seems to be in April-May, with lowest Varroa level then. Highest Varroa level in Nov-Dec. Maybe the lowest and highest months are somewhat different. No one seems to have measured to find out yet. Then it’s most logical to compare the figures from Nov 1991 with Nov 2012 and April 1993 with May 1996 and May 2016. 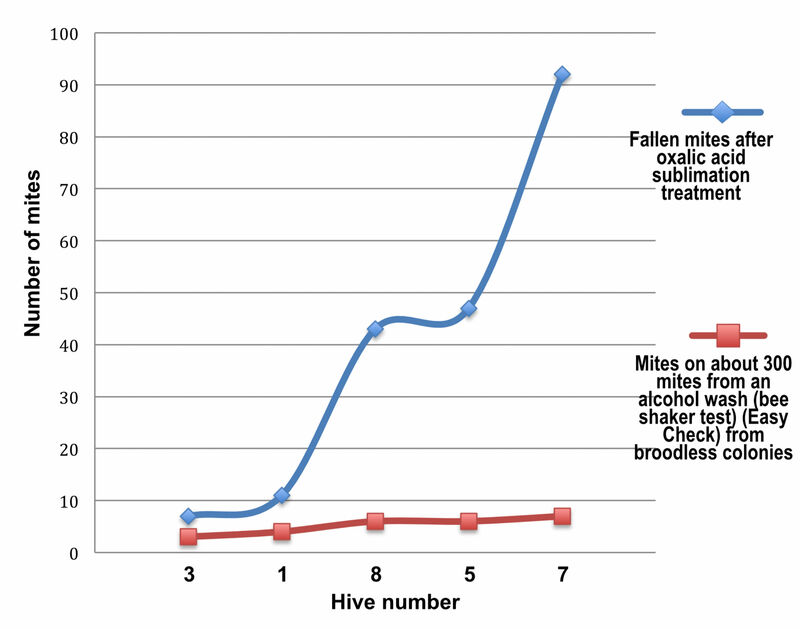 One thing is evident, the bee and mite populations are isolated from reinvasion from outside. No chemicals to fight mites and big agricultural crops are used, that can contaminate the colonies or lower the immune and defense systems of the bees. Cell size (about 4.9 mm) from the beginning anyway was that of the Africanized colonies brought there. The Africanized microfauna came with them as well. The first brood was nursed by healthy non-contaminated small bees that helped the new queens to epigenetically adapt to the new environment. When mites arrived in South Africa you could find colonies with huge amounts of Varroa, up to 50,000. No reports of big losses due to the mite were given, if any. 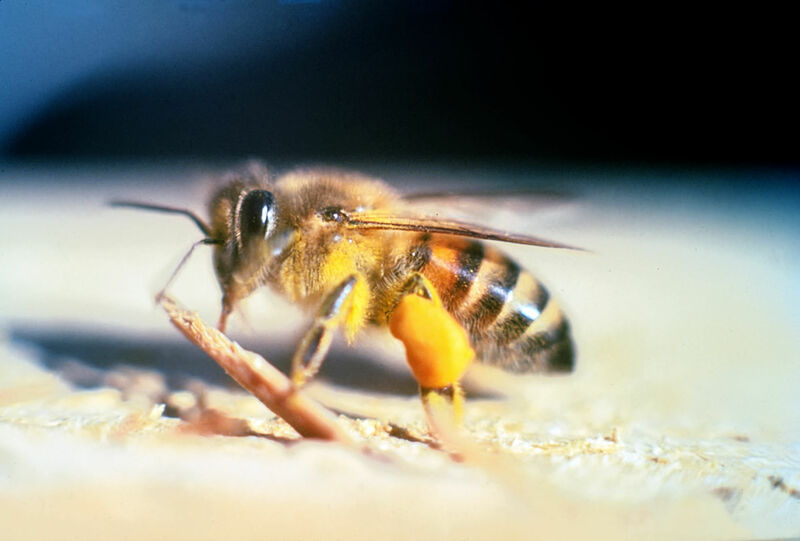 In about 5 years both the Cape bee (mellifera capensis) a little quicker than 5 years and the Savannah bee (mellifera scutellata) a little slower were found resistant to the Varroa mite (Mike Allsop doctorate thesis 2006). Today (2014) the varroa levels are low, and no miticides are used to control the mite. In May, which is autumn the average varroa level was about 2%. In spring, September, it was about 1.5%. No miticide chemicals are used or were used (more than a ittle in the beginning of the arrival). No bees full of viruses are spreading DWV. Click on the picture to get it larger. 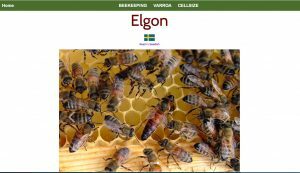 My testapiary for small cell Elgon bees Dec 1, 2017. 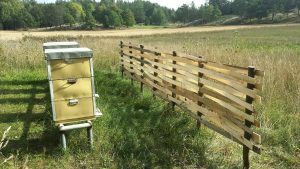 In autumn 2014 three colonies were brought from an environment with higher mite populations in some colonies within 2 km to an isolated test apiary, at least 3 km (2 miles) to other bees. None were treated in 2014 and no DWV-bees were observed. One colony was weak in spring 2015 and got one thymol pad (5 gr thymol). Two splits were made in 2015. In late June three colonies showed crippled winged bees (DWV). They hade varroa levels of 2, 3 and 7% and were treated with thymol pads. One colony with 3% varroa level showed no DWV and wasn’t treated. In August 2015 the Varroa levels were 0, 0,3, 0,3 0,3 and 3%. One weak colony that got a laying queen introduced late in the season died during the winter. Two spits were made in 2016, one were made in 2017. 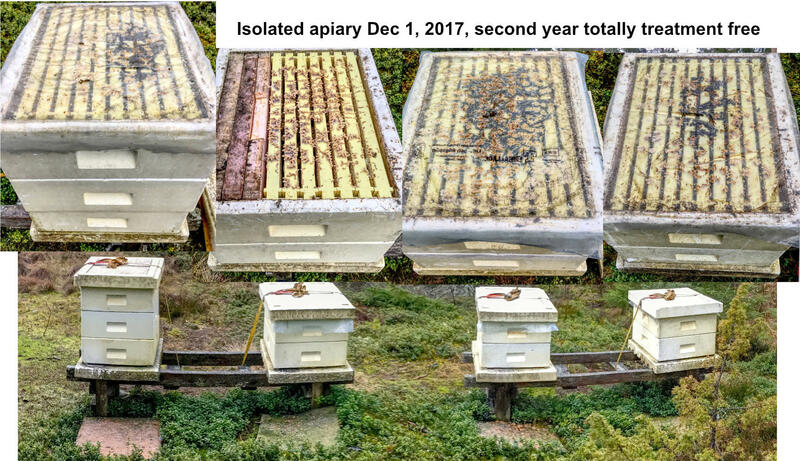 2017 was the third unusually bad year in a row and the apiary is placed in a forested area with low nectar resources. Varroa levels in average during 2016 was 0-1,5%, during 2017 0-1%. No treatment were used 2016 and 2017. Cellsize 4.9 mm – http://www.elgon.es/resistancebreeding.html – Strategy A. 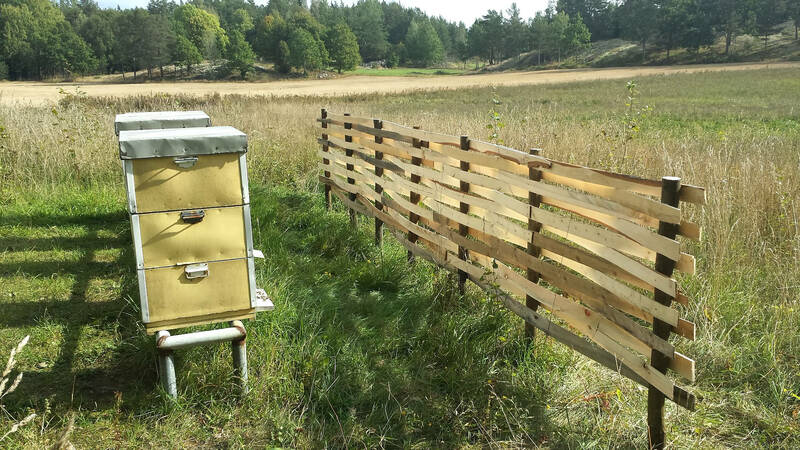 Isolated apiary, treat above 3 % varroa level. In most western countries we have a high varroa and virus pressure. Probably the result of heavy use of treating the colonies against mites for many years. In the light of what varroa levels finally stops at naturally, according to the above experiences, 1-4%, and the experiences I have had the latest years with treating colonies with varroa levels above 3% and replacing the least good queens – I find this strategy a good solution to get varroa resistant bees in even difficult environments. It may probably take a little longer if the new queens will mate with more than a few drones from susceptible colonies. But that doesn’t matter to much as a queen mates with in average 20 drones. The bad genetics will be weeded out quite quickly if you are keen in replacing the least good queens every year. Now I have updated the English one again. I found an even better application with which I could make an even better so called responsive website without knowing one letter of coding for being able to make it myself. Responsive means it automatically changes when you use a device with a different width on the screen, for example a mobile phone or an iPad. I found this tremendous app on Appstore, named Wolf, for a very low cost. Maybe one article will be of certain interest for many. It’s the one named “Resistance breeding“. There I give the latest experiences concerning the new or modified strategies I have tried for some years now. I may well come back to them. Sometimes, the term VSH is used as meaning the same thing as varroa resistance. I think it’s helpful to clarify what VSH is. It is one of several resistance characteristics that affect the bees’ resistance to the Varroa mite. VSH is not the same as uncapping capped brood cells with varroa inside and remove the pupae. It is one of a few different varieties of cleaning varroa invaded brood cells. 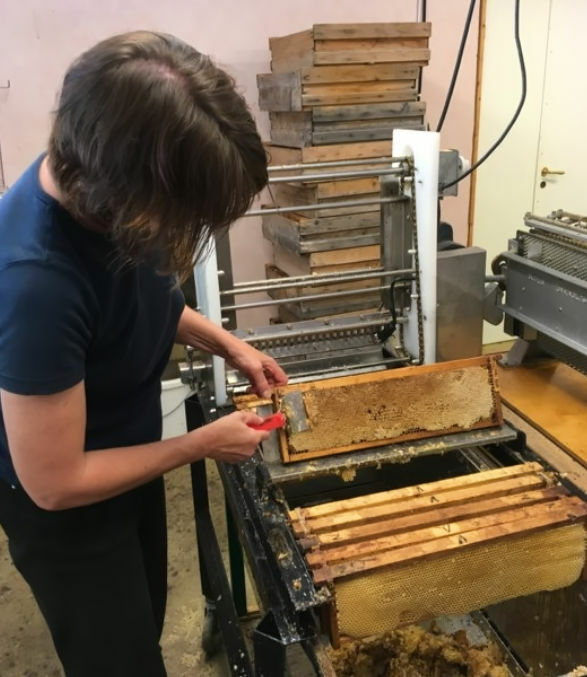 – VSH is opening (+ possible recapping, and / or + possible removing the pupae) of capped workerbee brood cells (not dronebrood cells) in which one or more varroa mites have entered AND the presence of offspring (children) to this (these) varroa mite(s) in these cells. As we see from the description here there could be different varieties of this trait. It isn’t needed that the bees remove the pupa for this behavior to de called VSH. It is enough that they uncap pupae with invaded mites with offspring. The bees may well recap it again. Uncapping is enough to disturb the reproduction of the mite. Is this difference in behaviour (recapping the cell and not removing the pupa) due to genetic difference? 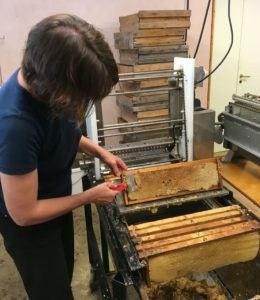 – Uncapping and cleaning of capped workersbrood cells with varroa which have no descendants is not VSH. – Other properties like grooming (removal and biting of mites from the body of other bees or themselves is an important feature, especially if the colony is reinvaded by mites. – Resistance to viruses, for example in the form of good production of suitable peptides (short amino acid strings) which “eat” viruses is important. 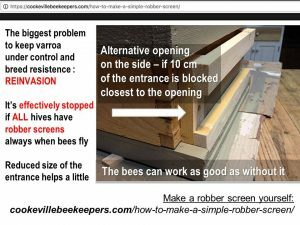 – Reduced inclination for robbery is not VSH, but is a good feature, as it means less risk for reinvading/reinvasion of mites from bee colonies with increased varroa level and as a consequence thereof a reduced defense against robbery. – Good defense at the entrance not letting foreign bees enter the hive prevents bees with mites on them from other colonies to raise the varroa level..
– Bees that return to their own hive and not to the neighbor’s (drifting) is an important feature to prevent the spread of mites within the apiary. – Forcing virus infected bees to leave the hive is one way for the hive to get rid of viruses, it’s not VSH, still very good. The house cleaning bees treat virus infects bees like trash, bees with damaged wings (DWV) or worker bees hatched too early (grey bees crawling around, APV-types). – There are I’m sure more traits that are important for resistance. VSH is a good feature! VSH can sometimes be confused with less good development for a bee colony. This depends most often on a queen not laying eggs very well. 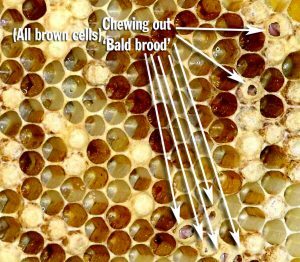 But if a VSH colony is getting a lot of mites through reinvasion from colonies with high varroa levels in the neighborhood (within a distance of 2 km/1.5 miles) the result may be a lot of shotgun pattern brood combs due to a lot of uncapped and cleaned brood cells to get rid of mites. The consequence will be a slower development of the colony. But as mentioned above a true VSH trait give room for the variety that the pupae are not removed but they are recapped after uncapping. And this can happen more than once. In such a case the consequence needn’t be slow development of the colony even if the varroa level temporarily is a bit high. Perhaps it’s good if more short names, such as acronyms as VSH, become common, names for different characteristics of resistance. – With regard to the concept of Grooming, This term is well established. Bees have mites on their body and these are removed by other bees or themselves. We need no other term here. 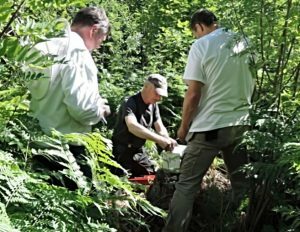 – As far as VSH on drone is concerned, it is quite newly discovered and no special acronym is used as far as I know. VSHD = Varroa Sensitive Hygiene Drones. That’s an important feature, maybe more important than VSH. The acronym VSHD could work well. The mites are more attracted to dronebrood than to workerbrood. 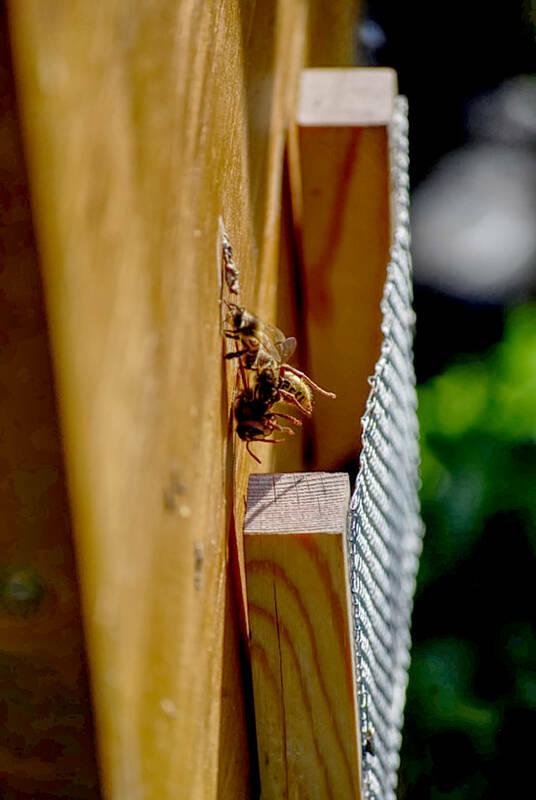 If a colony has 5-10% dronebrood in the brood area, as is often found in feral colonies (at least) and bees have a strong VSHD, the bee colony will not lose so many worker pupea (future valuable worker bees). Many mites will invade drone brood and will be cleaned out from this drone brood. The Norwegian Hans-Otto Johnsen has shown (he is conducting such surveys and there is some notes about this in Norwegian bee magazine Birøkteren and on this blog) that bees more easily identifie mites in smaller dronebrood cells (6.2 mm) than in larger (7.2 mm), and clean out them from mites and pupae. 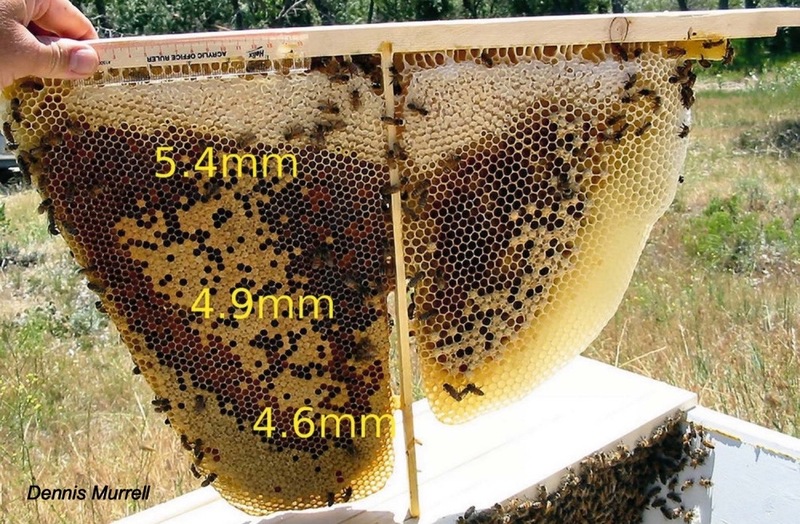 Bees make smaller dronebrood cells naturally, the smaller the cell size is for workerbee cells. This is probably an important characteristic that small cell size provide. The drone cellsize is naturally 6.2-6.4 mm when the bees live on 4.9 mm worker bee cells. – ED for entrance defense. – LR for low robbery. – VP for virus peptides. – If you have suggestions or comments don’t hesitate to share them, for example concerning more resistant traits. Maybe you have ideas how to measure resistance traits? 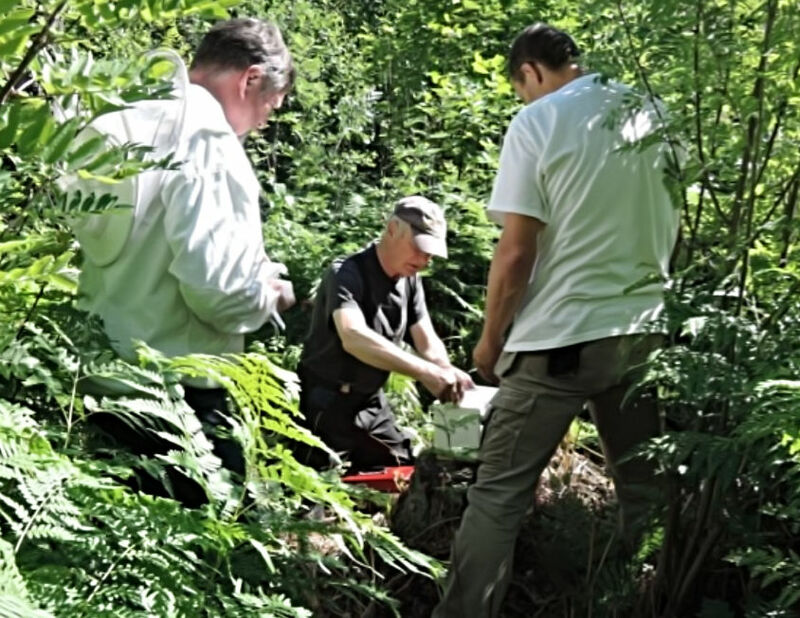 Maybe the best selective tool is just measuring the varroa level a few times a year? An expression often used is “according to science and proven experience”, for example when we want to give authority to what we have chosen to do or when we argue for something (or against it). In the previous post on this blog I made a comment on what science is and who is a scientist. The second part of the expression, proven experience, is worth commenting on as well. “This is true, as far as we know today”. The science knowledge is coming from following the scientific rules in making tests and discussing the results, often with statistics. 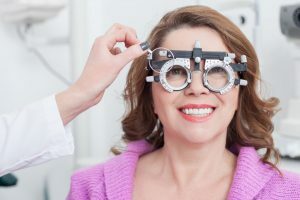 “Proven experience” is knowledge obtained through other means than scientific tests, often from experience during many years getting the same results when doing things the same way. Is it false knowledge or bad knowledge? Of course not. That’s why it’s used by scientists, and used others as well. 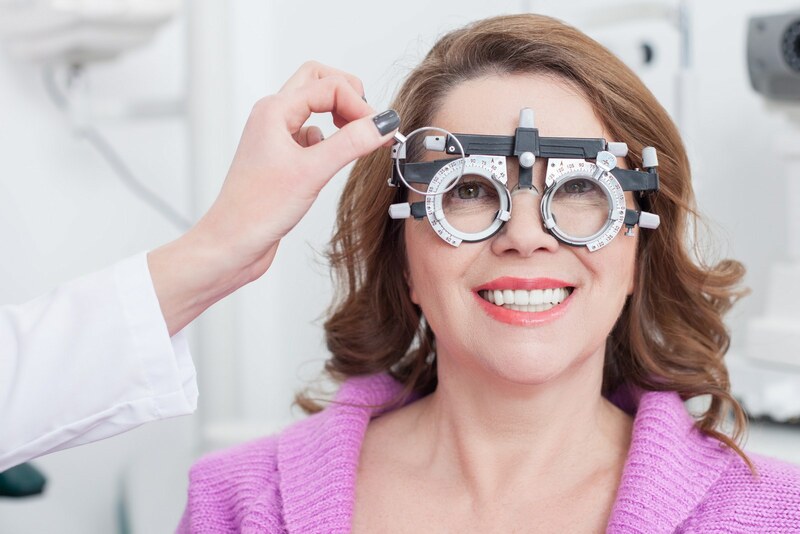 If for example no advice would be given concerning anything until you had scientific tests confirming methods or descriptions, not many advices would be given. And not much would be done if there were nothing done until science had to say anything on the topic from relevant scientific tests. There is much that is not confirmed or contradicted by science that concerns what we do in everyday life. And yes, many things we do may be completely or partially incorrect. And even advices we follow from scientists change after a number of years, sometimes radically, when they and we know better. This is also the case with proven experience. When it comes to scientific tests, after some time we may realize that tests done are designed with lack of knowledge concerning some important facts. If these had been known the tests had been designed differently and results had maybe been different. Sadly, sometimes also scientists (as all other types of people) have been revealed to cheat. (Why do people cheat anyway?) One way of doing this is to consciously design a test so that you most probably will not get a clear result. With bees and varroa tests you just keep what you call control colonies and test colonies enough close to each other (within 2 km [1.5 miles] from each other) and let the mite populations raise high enough. Reinfestation between these colonies will more or less even out varroa populations. As a result, you will find it more difficult to see differences in varroa resistance traits between bee colonies.